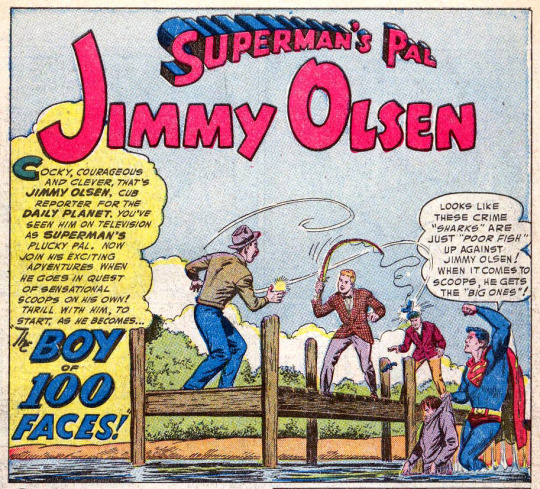 The character of Jimmy Olsen, cub reporter at the Daily Planet, originated on the radio show The Adventures of Superman in 1940. Superman’s creators Jerry Siegel and Joe Shuster brought the character to comics in 1941, fleshing out his personality and physical appearance, but after using Jimmy in a handful of stories, they dropped him. In late 1953, while Jack Larson was playing the character on The Adventures of Superman television show, the character was revived in the comics after a 10-year absence, and shortly thereafter given his own book. 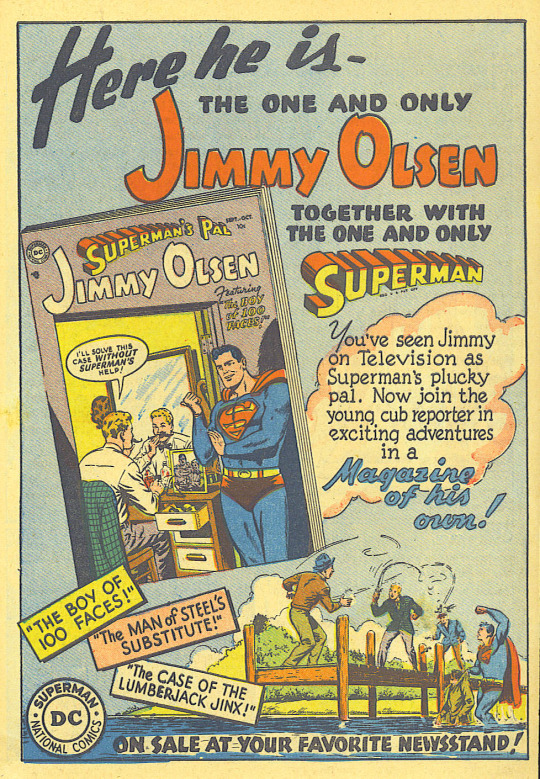 This tie-in to the TV show was emphasized in the very first panel of the comic—”You’ve seen him on television”— as well as the house ads promoting the new title. Clearly, DC felt confidant in the association with the show and assigned Superman’s top creative team to the project. Writer Otto Binder would go on to introduce key elements of the Superman legend—Supergirl, Krypto the Superdog, The Legion of Superheroes, and many others. Artist Curt Swan would come to define Superman and related characters for the next three decades. 1. The Boy of 100 Faces! In this story we get to see Jimmy use his 100 disguises. And by 100 they actually mean two. 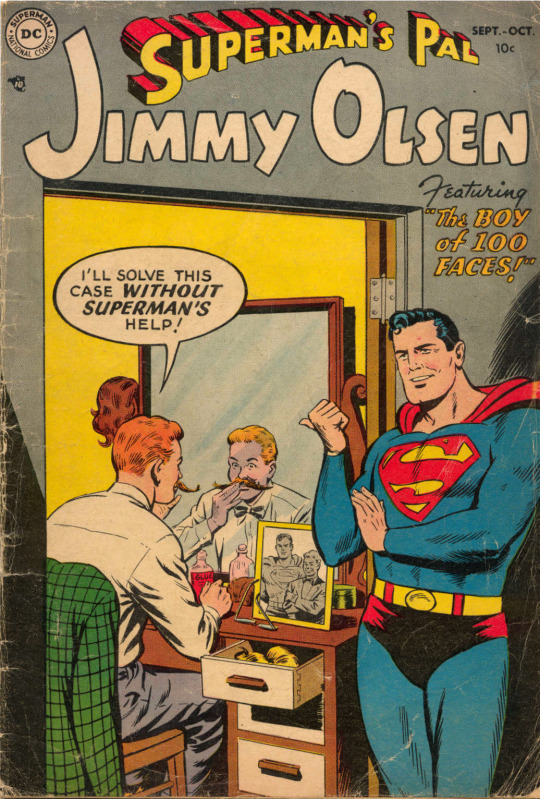 Dressing up as a ice cream vendor and a brush salesman doesn’t even require Superman’s pal to use any of the mustaches, wigs, or makeup shown on the cover. Typical comic book bait-and-switch. 2. 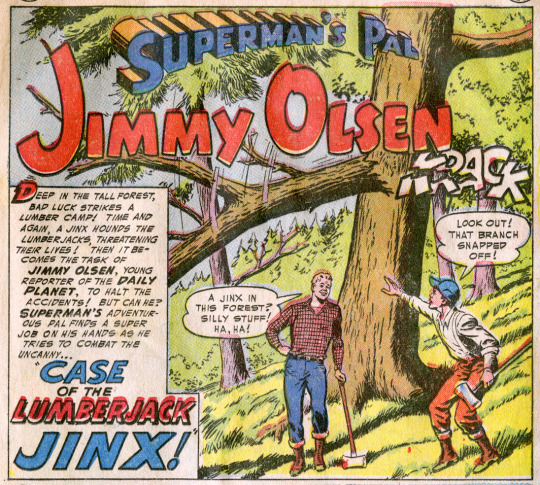 Case of the Lumberjack Jinx! Jimmy goes undercover as lumberjack “Jimmy Wayne” to investigate mysterious mishaps at a lumber camp. Superman puts in an appearance but Jimmy surprisingly solves the case without any super-help. 3. The Man of Steel’s Substitute! When Superman is unavailable, Jimmy attempts to take his place. His valiant efforts are a dismal failure, but the fact that for a moment he seems likely to succeed, stretches credibility way past the breaking point. Consider that part of his plan involves projecting a movie of Superman onto a cliff outdoors in broad daylight to make it look like the Man of Steel is flying by and you’ll get the idea. And that might have been the best part of the plan! 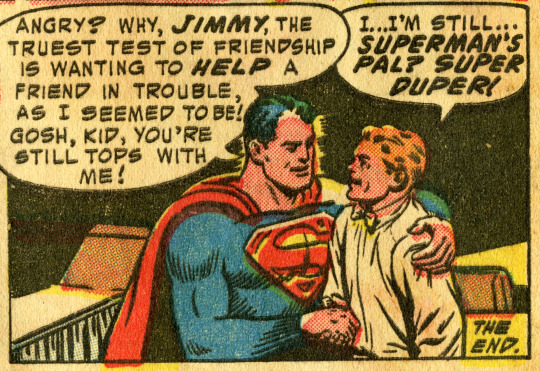 Of course, Superman himself shows up just in the nick of time to save the day, but Jimmy is disappointed in how he handled the situation and expects Superman to “call off their friendship”. It turns out Superman appreciates what Jimmy did even if it wasn’t successful. Super Duper! 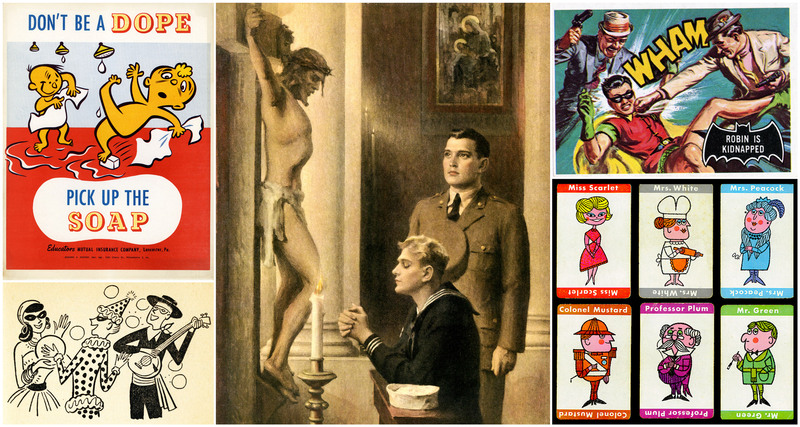 Top to bottom, left to right: 1) insurance poster (artist unknown), 2) illustration by Charles Aromando from Etiquette for Young Moderns by Gay Head 1954, 3) thrift store find (artist unknown), 4) Robin is Kidnapped Batman trading card #29 by Bob Powell (layout) and Norman Saunders (painting) Topps 1966 , 5) Clue board game cards, Parker Brothers, 1960. I saw a documentary on Netflix recently about Bill Watterson and his comic Calvin and Hobbes which inspired me to read some of the strips. Nothing could more accurately convey the way I feel today. 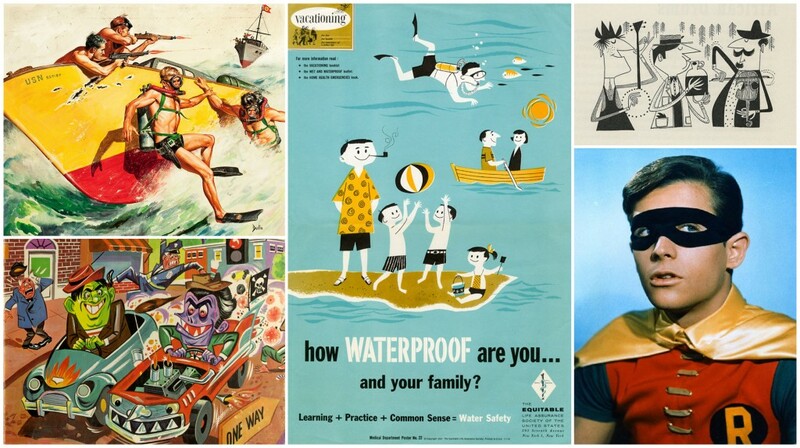 Top to bottom, left to right: 1) Illustration by John Duillo, 2) Jaymar picture puzzle “Chicken Charlie” (artist unknown), 3) insurance poster (artist unknown), 4) illustration by Cliff Roberts from The First Book of Jazz by Langston Hughes, 5) Burt Ward as Robin in the 1966-68 Batman TV show. My most recently published comic got a nice mention from Rob Clough in The Comics Journal today. Craig Bostick’s “Guitar Bass Drums” is a brilliant short piece about three members of a band and the sexual politics of adding a new member. Each page is narrated by a different member of the band and is color-coded. Bostick’s been making great comics about musicians for years, but there’s a beautiful simplicity of structure in this piece that elevates it above past efforts. 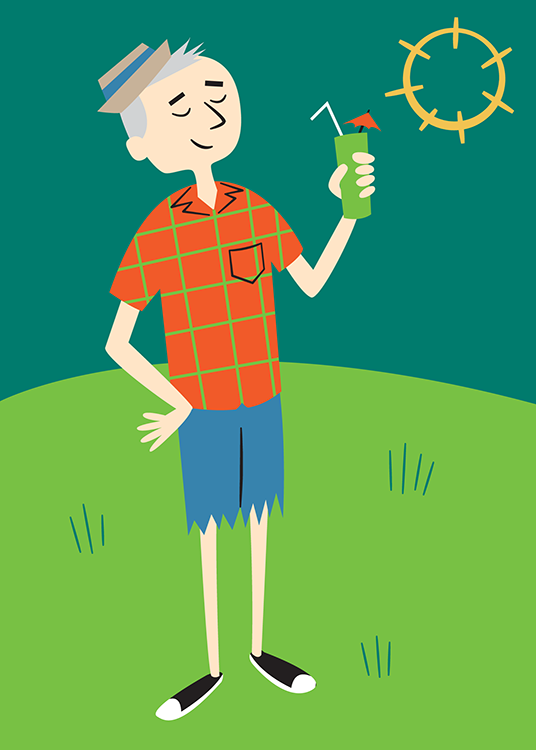 A self-portrait wearing my summer uniform. Here in Boston, this is wishful thinking. Bat-Mite was a magical imp from another dimension who claimed to be Batman’s biggest fan. He wore a suit inspired by his idol and loved to visit Gotham City to see the Caped Crusader in action. And the more action the better. If he thought Batman and Robin were succeeding too easily in their fight against crime, he used his powers to throw up some obstacles to prolong the adventure. You know, just for “fun”. Batman didn’t appreciate this and was always threatening to spank the little pixie. In spite of all this, he didn’t intend to cause any real problems and, sometimes, his powers came in handy helping the Dynamic Duo. Bat-Mite pestered Batman from 1959 to 1964 when an editorial change resulted in the imp (along with Bat Woman, the Bat-Hound, and the original Bat-Girl) being shown the door. FUN FACT: Bat-Mite appeared in four episodes of the Cartoon Network’s “Batman: The Brave and The Bold” in 2009-2011 and was voiced by Paul (Pee Wee Herman) Reubens! Check out the rest of the cards in the series. 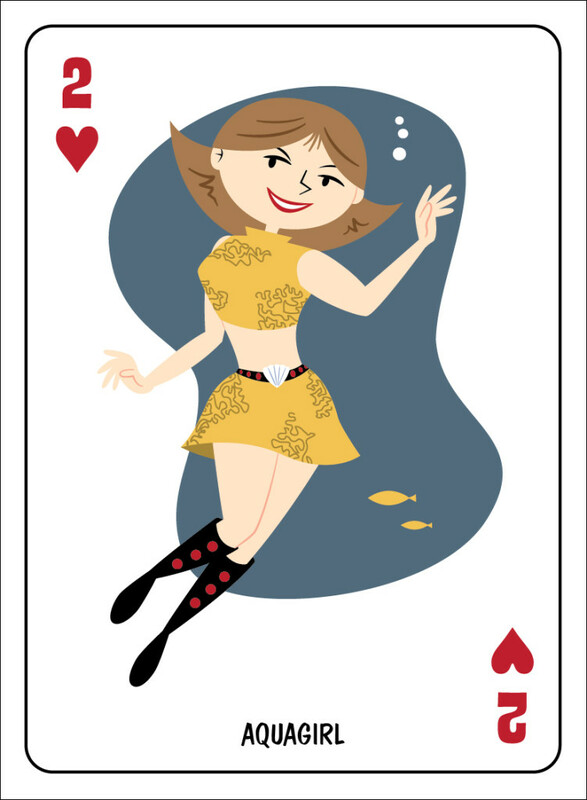 Illustrating one playing card a day using characters found between 1957-1967 in DC Comics. Tomorrow: the last post of the series—the back design! Bizarro No. 1 was the original dim-witted duplicate and the leader of Bizarro World, where women went to the ugliness parlor and their children were punished for good grades. Bizzaro was definitely no hero, but he wasn’t really a criminal either—just an annoyance, primarily to Superman. He and his crazy cohorts were a big part of comics of the time, even starring in their own feature in 15 issues of Adventure Comics in the early 1960s. It’s hard to imagine what inspired this peculiar concept or why it was such a big hit with readers. But looking back at the Bizzaros, they embodied the goofy spirit of the times (contrary to their silly code) perfectly. 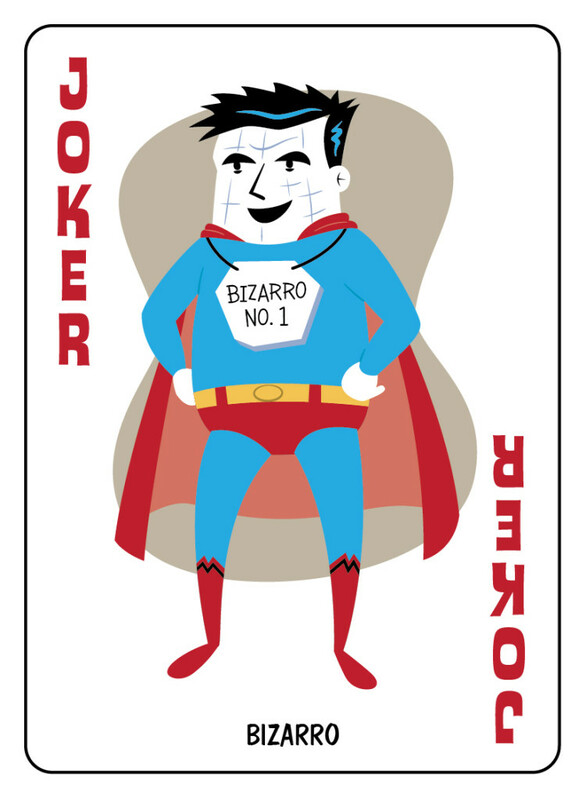 Illustrating one playing card a day using characters found between 1957-1967 in DC Comics. Tomorrow: Bat-Mite! In 1967, Aquaman was arguably at the height of his popularity—with both his own comic and Saturday morning cartoon. The character had recently gotten married and had a baby, so it probably seemed the next logical expansion of his supporting cast was to create a love interest for his sidekick Aqualad. Of course they ended up getting into a lot of trouble requiring Aquaman to save the day, but the kids ended up seeing the error of their ways and everyone lived happily ever after—at least until the next issue. Aquagirl was apparently wildly popular with the readers but not much came of her. The writers of the time didn’t seem to know what to do with female characters and she often just served as babysitter for Aquaman’s son. Considering the recklessness and irresponsibility she exhibited in her first appearance, she might not have been the best choice for that job. 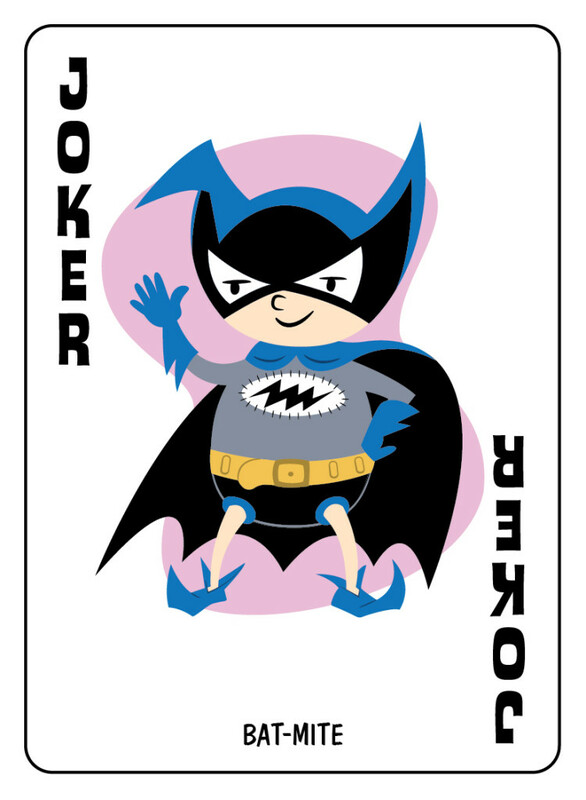 Illustrating one playing card a day using characters found between 1957-1967 in DC Comics. Tomorrow: Bizzaro! It’s been a while, but I’m ready to finish this series. First up: Robin! Batman’s junior partner, Robin, has been around almost as long as the Caped Crusader. Introduced in 1940, just a year after Batman’s debut, Robin was created to lighten the dark tone of Batman’s stories and appeal to young readers. He was the first young sidekick of a comic book hero, but because of his instant popularity, he was not the last. Soon, it seemed, almost every hero was adopting a “young ward”. Eventually, the propriety of these relationships would be questioned—most famously in Seduction of the Innocent by Fredric Wertham in the mid-1950s. Wertham asserted, among other things, that Batman and Robin were gay. The book led directly to Congressional hearings on the content of comic books and the creation of a regulatory association, the Comics Code Authority. After the uproar, an effort was made to romantically link the Dynamic Duo with women, but the resulting stories were often just as awkward and campy as the ones that caused all the fuss in the first place. If you’re like me, the name and costume for Robin never made sense. It seemed weird he wasn’t Batboy or something along those lines. As it turns out, he wasn’t named after a bird but inspired by Robin Hood. That still doesn’t explain the impractical pantsless look though. I guess if you’ve got the legs, you might as well show them off. 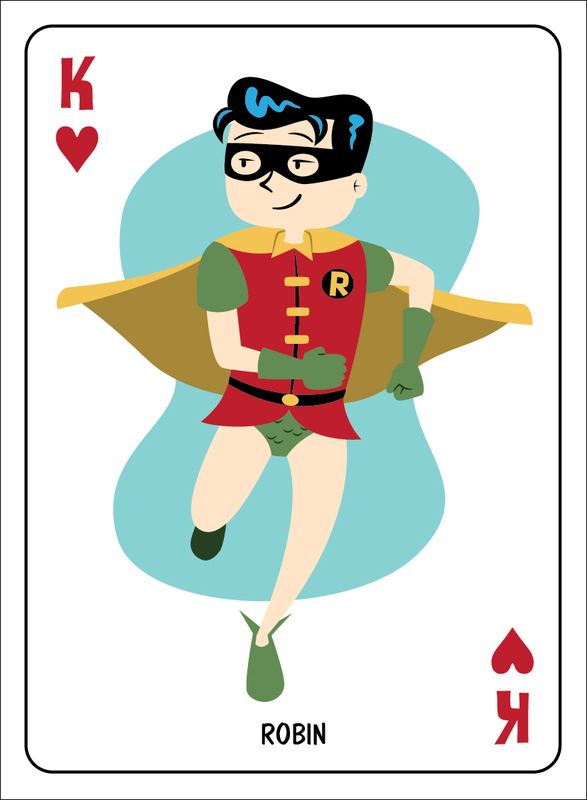 Illustrating one playing card a day using characters found between 1957-1967 in DC Comics. Tomorrow: Aquagirl!